As a leader in community health, we cordially invite you to sponsor Communities Joined in Action’s (CJA) 12th national conference, entitled “Making Connections: Optimizing Health for All” taking place February 14-16, 2018 in Atlanta, GA. The annual conference will include more than 200 community health leaders and consumers who are committed to improving health and health outcomes through achieving equity. This gathering of public health leaders and catalysts creates a dynamic forum for the exchange of ideas among our membership and stakeholders to learn lessons and share knowledge that will improve our health care system and contribute to the goal of creating health equity for all people. As a sponsor, you will enable and empower diverse community stakeholders from across the country to participate in educational sessions and share emerging lessons that will inspire and inform their efforts in local communities. Your support will allow conference attendees to learn best practices and tools from thought leaders and organizations from across the country. Attendees will also participate in workshops and plenary sessions to collaboratively engage in dialogue and share ideas to improve health measures. You may also choose to sponsor the attendance of a deserving student, senior or non-profit leader to allow maximum dissemination of the knowledge and ideas shared. We are excited about the opportunity to partner with you to offer a dynamic, engaging and educational conference to community leaders, stakeholders and members of the community. 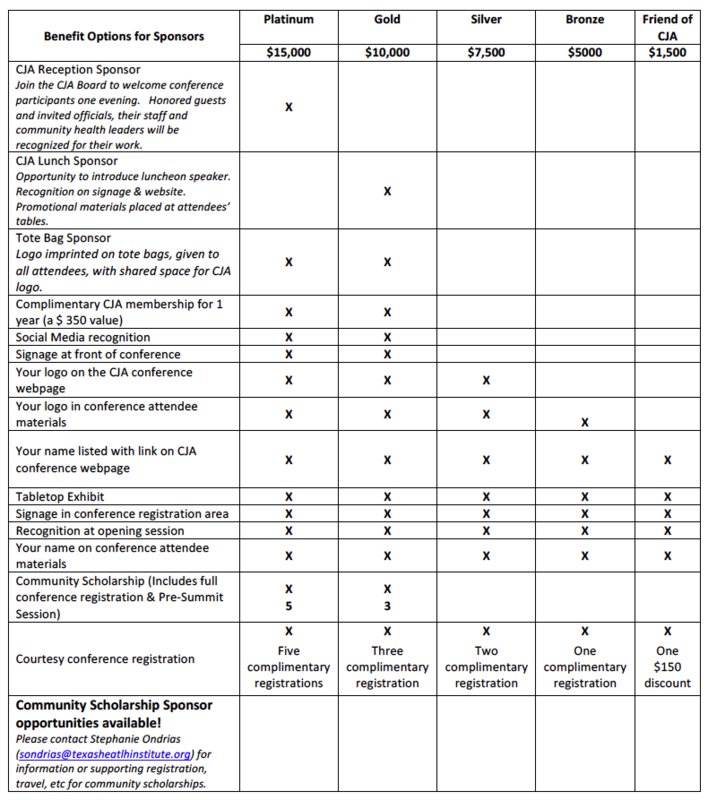 Find out how to be a sponsor for the 2018 CJA National Conference CLICK HERE.